JOURNEYS THROUGH TIME: "Atishoo, Atishoo We All......."
In recent days I've been remembering my adoptive father telling me about the 1918 Spanish Flu to which, as an infant, he lost his mother then one week later his sister. His grandmother, who later reared him following the death of his father in an accident in Wales, told him that his sister was actually the first in the family to contract the virus. As her mother would have been her sole carer it's not surprising that she too would eventually succumb to the infection given that hygiene conditions back then would not have been at their best. What I find amazing is that none of the other family members were infected. As a youngster it was quite frightening listening to Dad talk about what sounded like a deathly plague from the Middle Ages so last week when I first heard the news reports of a possible flu pandemic it immediately sent a familiar shiver down my spine. My feeling is I don't think we have to panic just yet, if at all, because this time around we not only have the treatments but thanks to modern technology and twenty four hour TV channels we now have up-to-the-minute information on how the virus is being transmitted, whether those affected are coming from Mexico or person-to-person plus simple hygiene precautions to prevent its spread. The 1918 flu pandemic claimed up to fifty million lives, I hope and pray that those statistics remain well and truly confined to the history books. 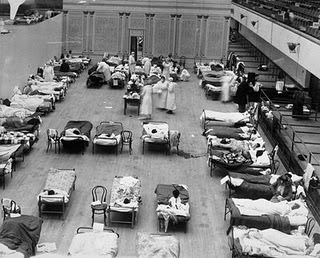 *The above image, sourced from Wikimedia, shows American Red Cross nurses tending to 1918 flu patients in temporary wards set up inside Oakland Municipal Auditorium. Maybe you want to see my photo blog. Thank you Anonymous. Yes indeed we hope and pray. Thank you so much Steinar. Your images are breathtakingly beautiful, particularly the sunsets.